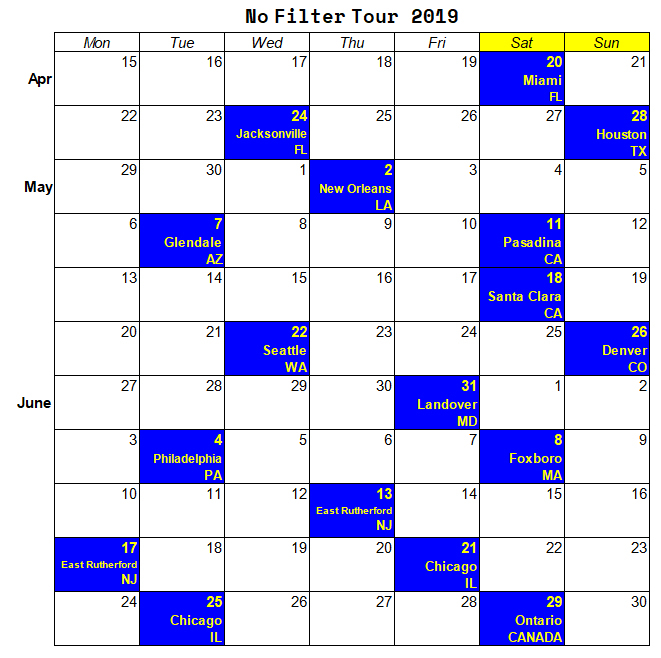 Updates: Nov 03: Denver Colorado rumoured city added. 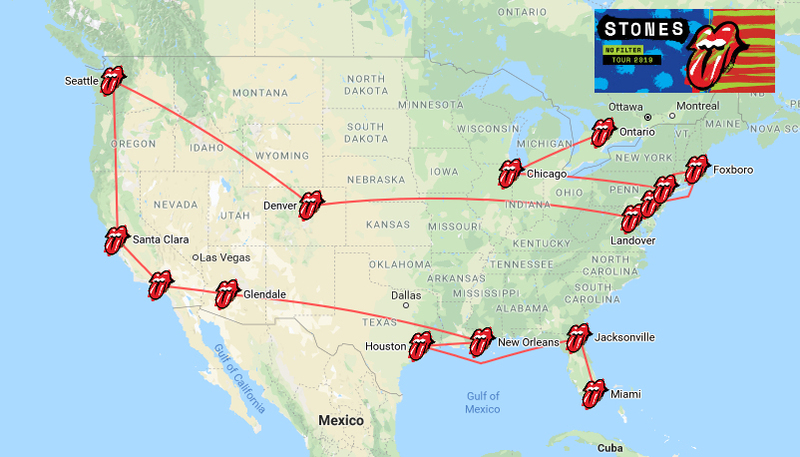 Nov 04: Foxboro/Boston rumoured city added. Nov 12: Metlife Stadium NJ rumoured shows added. Nov 12: Jacksonville, FL rumoured show added. Nov 13: Soldier Field Chicago rumoured show added. Nov 13: Rose Bowl, Pasadena, CA rumoured show added. Nov 13: Santa Clara, CA rumoured show added. Nov 13: Houston, TX rumoured show added. Nov 13: Seattle, WA rumoured show added. Nov 14: Miami FL rumoured show added. Nov 14: Jazz Fest, New Orleans, LA rumoured show added. Nov 14: Miami/Jacksonville date might be April 20/24. Nov 14: Philadelphia PA rumoured show added. Nov 15: Miami and Jacksonville rumoured dates updated. Nov 15: Chicago shows moved to the end of the tour Nov 15: Landover MD near washington D.C. rumoured show added. Nov 15: Glendale AZ (near Phoenix) rumoured show added. Nov 16: Lincoln Financial Field, Philadelphia, PA rumoured show date added. Nov 16: Gillette Stadium, Foxboro (near Boston) MA rumoured show date added. Nov 17: Rose Bowl, Pasadena, CA rumoured show date added. Nov 18: Soldier Field, Chicago, IL rumoured show dates added. Nov 18: CenturyLink Field, Seattle, WA rumoured show date added. Nov 19: NRG Stadium	Houston, TX rumoured show date added. Nov 19: State Farm Stadium, (University of Phoenix Stadium)	Glendale AZ (near Phoenix) rumoured show date added. Nov 19: Levi’s Stadium,	Santa Clara, CA rumoured show date added. Nov 19: Broncos Stadium at Mile High,	Denver, CO rumoured show date added. Nov 19: FedExField,	Landover MD (near Washington DC) rumoured show date added. 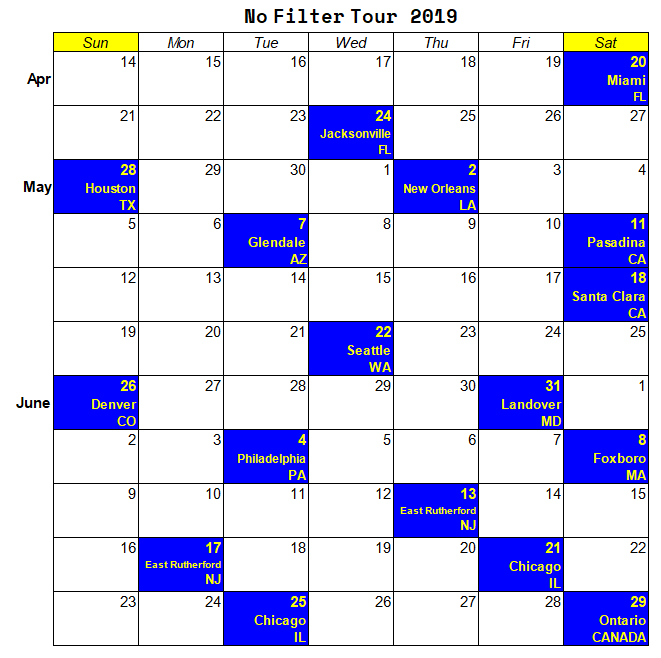 Nov 19: All shows in the IORR list of rumoured dates are confirmed, except for New Orleans (expected to be announced by Jazz Fest soon), Metlife Stadium NJ 2nd show June 17 and Soldier Field Chicago Il 2nd show June 25 will probably be announced once tickets for the first shows at these venues are moving at an expected speed. Nov 28: 2nd shows at Metlife Stadium NJ and Soldier Field Chicago IL confirmed. Jan 15: New Orleans show confirmed. Feb 9: Toronto Canada rumoured show added. Feb 10: Burl's Creek Event Grounds rumoured location for the "near" Toronto Canada show. Feb 11: Burl's Creek Ontario Canada show confirmed. Mar 30: The tour is postponed. New dates will be announced soon.